CSM’s Advanced Tutors, from left, are Derek Adams, Alea De Belen, Cameron Williams, Myles Mayshark-Hamlin, Chelsi Randall, Gabriela Zabel, and Samantha Zabel. Quality tutors are an essential tool that College of Southern Maryland provides its students to ensure their academic success. 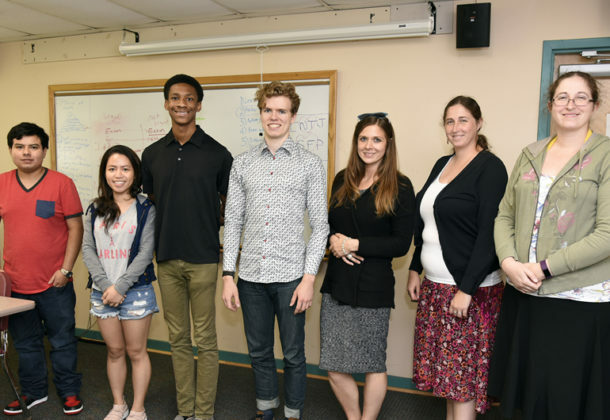 Recently, seven College of Southern Maryland peer tutors completed basic, intermediate, and advanced tutoring training over the summer in order to be Better Tutors for the CSM students who need help in their fields of study. The seven peer – or student – tutors join three other tutors at CSM who have achieved National Tutoring Association Certifications. The college’s advanced tutors are available for face-to-face, free help to all currently enrolled students. The Learning Centers at CSM provide tutoring at all of the CSM campuses, including the Waldorf Center. There are nearly 40 peer and professional tutors on staff who can help with group tutoring throughout the day and evenings at designated tutoring rooms. Tutoring is offered in a several subjects like English, math and biology. Tutoring on campus is walk-in, with no appointment necessary. Learning Centers are located at the La Plata Campus in the Library, Room 118; at the Leonardtown Campus in Building B, Room 111; and at the Prince Frederick Campus in Building A, Room 125 and various locations at the Regional Hughesville Campus and the Waldorf Center. Adding to face-to-face tutoring, online tutoring services are available 24 hours a day to currently enrolled credit CSM students in the areas of math, writing, English as second language, accounting, economics, and chemistry. Learn more about tutoring schedules and locations on CSM’s website.